Seattle Chamber Players, Nonsequitur, and Washington Composers Forum present Dutch pianist Tomoko Mukaiyama and her video performance work haar/haar (her/hair). Originally scheduled as a solo performance at Consolidated Works, Tomoko Mukaiyama will instead perform haar/haar on the second half of the Seattle Chamber Players concert entitled Tomoko’s Amsterdam on May 14. An hour-long piece that involves video projection on two screens adjacent to the piano, a pre-recorded soundtrack that interacts with the live piano and musical sources that range from Bach and Beethoven to Ligeti and Thelonious Monk, haar/haar is a self-described “Sonic Labyrinth, or a Forest, which interlaces various piano pieces through the 400 year history from Baroque to contemporary.” The first half of the program features the Seattle Chamber Players performing works by Dutch composers, including Louis Andreissen, with a film by Hal Hartley. One of Amsterdam’s foremost pianists, Tomoko Mukaiyama guides SCP through today’s Netherlands where performers, film and boombox meet. Born in Japan, Tomoko Mukaiyama currently works in Amsterdam. After winning the International Gaudeamus Prize in 1991, she received invitations for solo recitals and concert appearances in Europe, Asia, and America. She won Japan’s Muramatsu Prize in 1993. Her unique approach to the piano, in which she employs her voice and body, has inspired many composers including Frederic Rzewski, Louis Andriessen and Alexander Raskatov. As a result, many pieces have been composed and dedicated to her. She has been invited to perform with Ensemble Modern, London Sinfonietta, Ensemble Intercontemporain, and the Rotterdam Philharmonic Orchestra. She has collaborated with cinematographers, designers, architects, dancers and photographers, such as Ian Kerkhof, Marina Abramovic, MERZBOW, and Kim Ito. 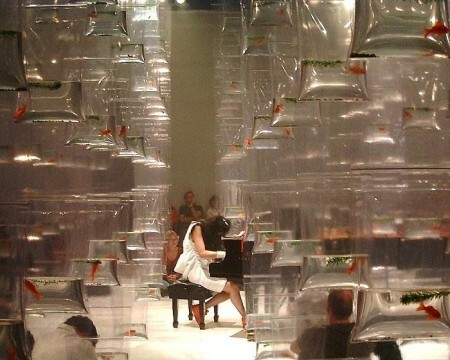 Her original style of expression using video and sculptural installations has opened new musical frontiers. Hailed for daring and intelligent programming, uncompromising artistry and spirited performances, the Seattle Chamber Players (SCP) enjoys a growing international reputation. For fifteen years, SCP’s four core members—Laura DeLuca, clarinet, David Sabee, cello, Mikhail Shmidt, violin, and Paul Taub, flute—have been passionately dedicated to introducing rarely performed and previously unheard contemporary chamber music of the highest quality to the Pacific Northwest and audiences worldwide. The ensemble’s work has been recognized with the ASCAP/Chamber Music America Award for Adventurous Programming.